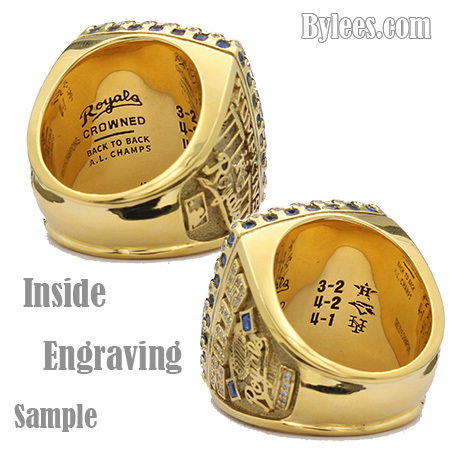 Which part I can customize from the original champion rings? Position: side face, where the orignal locates. 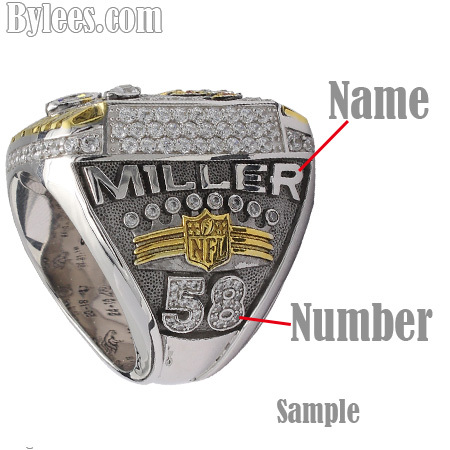 if original rings without number, we will NOT custom numbers. default name and number will be same as the photos show if you prefer to keep the original. Custom-made request : To be ready4-6 weeks. Custom-made request: To be ready4-6weeks. The above mentioned ready time are based on payment received. The above mentioned time is production lead-time,not including the period of discussion on artwork before final confirmation. the production time might be postponed in public holidays/Festivals, we will notify you duly. Shipping time depends on the Express couriers. Shipping notification with tracking number will be sent to your email. we make NO Warranties for delay in the transit time due to local holidays/Festivals/customs inspection. Address offered to be specifed , NO simple PO Boxes or APOS accepted. Each coupon is identified with coupon code, and has different requirements and rewards. read before use please. Coupons are intended by single use only. Some promotional offers may not be combined with other offers in the same order, Generally, only one coupon code may be used per order. Coupons’s face value cannot be exchanged for cash or gifts. Coupons cannot be extended once expired. Once order get confirmed and payment received, we will proceed production, any changes afterwards may lead to additional costs,such as labor costs and material costs. Remember, how often it occurs, how much it may cost & more. Cancellation is not allowed once order get confirmed, as the production have been arranged. After receiving the item, cancellation requests must be within 10days , The buyer is responsible for return shipping costs. Please e-mail us with photos or videos to show the item problem if there is any, once we have received the email, we will contact you to arrange the return/exchange details. The period of 10 days is calculated from the date the item is dispatched. Any item exceeds 10days, we do not accept refund or exchange. It would be at the buyer’s own cost to return the unwanted item. We will also deduct the cost for shipping the item to you. – The refund will be done through Paypal within 3 working days after we receive the item and it will be transferred to the original account only. — please Keep your tracking number to ensure shipment can be traced promptly(in case of any or loss damage in the shipment), We can’t refund the payment without receiving the return items. We know that A ring to remember or celebrate someone or something important is so cherish to you , and we offer limited lifetime warranty for our rings . Re-sizing (up or down one size from the original size). Repairing defects in workmanship or materials on new rings(accepted within 10 days from the day of delivery, see the return policy). Note: the planted stones , through normal wear and tear, may eventually detach from their mounts, though relatively rare, if it happens, we can replant them for you with extra costs. Please contact us for details if you need any of the above service. We highly recommend you to buy insurance for your return shipping in case there is loss or damages. Besides, return shipping, handling and insurance fees would apply to all warranty and non warranty services. Warranty is invalid if any handling work performed on your ring by other Jewelers. Genuine stones and diamonds are not covered by warranty. Damages resulting from improper handling, lack of care, or normal wear and tear are not covered by this warranty.